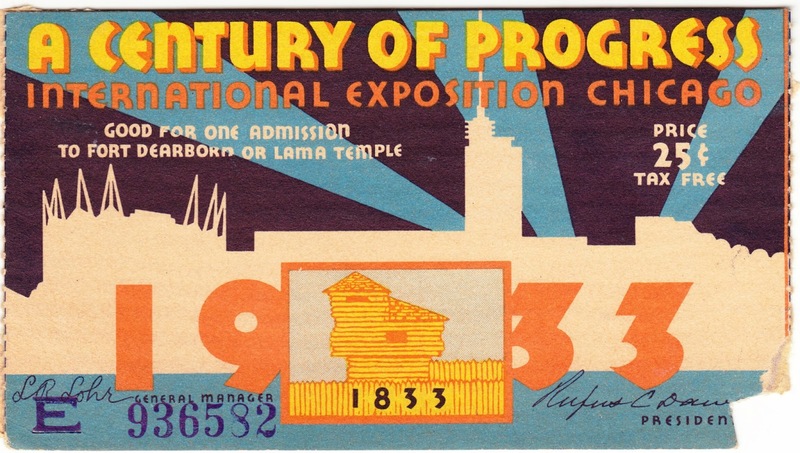 This is my great-grandmother's colorful ticket stub from the "A Century of Progress International Exposition," also known as the 1933 Chicago World's Fair. Color was a big part of the fair; per Wikipedia: "The fair buildings were multi-colored, to create a 'Rainbow City' as opposed to the 'White City' of the World's Columbian Exposition [in 1893]." The ticket price was 25 cents, the equivalent of about $4.60 today — a decent bargain for admission. Sarah looked at the stub this morning and said, "I thought for a second that said, 'Llama Temple.'" "It is the resplendent sight of the Golden Pavilion of Jehol, its gold-leaf roof glistening in the sunlight, that transports you to China of the Eighteenth century, with its culture and art that amaze and delight us today. It is placed westward from the Hall of Science, at Sixteenth street, like a jewel in a magnificent tiara. "The Golden Pavilion, the original of which was built in 1767 at Jehol, summer home of the Manchu emperors from 1714 until the termination of the dynasty twenty years ago, was brought to the 1933 World's Fair and the City of Chicago by Vincent Bendix, exposition trustee. Dr. Sven Hedin, noted Swedish explorer, acting for Mr. Bendix, spent two years in Mongolia before he selected this as the finest existing example of Chinese Lama architecture. "Exact reproductions of the 28,000 pieces of which the Temple is composed were made and numbered at its original site in China. A Chinese architect was employed to interpret these marks and to direct their assembly on the exposition grounds. Chinese artists painted and decorated the finished structure. "The Golden Pavilion is 70 feet square and 60 feet high, rising from a 4-foot pedestal. Its double decked roof of copper shingles is covered with $25,000 worth of 23-karat gold leaf. On the exterior, twenty-eight columns in red lacquer, 16 feet high, support the lower deck. Twenty-eight other columns, 30 feet high, form part of the wall. Inside, twelve 37-foot columns support the gilded ceiling and the upper deck. "Carved grills, in red, blue, yellow and gold, enclose the glass window panes. The cornice beams are gilded and carved with images of dragons, cats, and dogs. Hundreds of pieces of carved wood form the ceiling. ... There is an interesting temple drum, trumpets so long that the player requires the services of an assistant to hold them up, bronze and gilded wooden Buddhas, images of numerous other gods and goddesses, altar pieces, incense burners, trumpets, masks used in sacred dances, silver lamps, temple bells, and rare carpets." The elaborate exhibit surfaced again at the 1939 New York World's Fair, but it was not as successful, and, depressingly, according to www.1939nyworldsfair.com, "after not getting much attention in 1939, a girlie show was added in 1940." And after that? The final story (perhaps) of the Bendix Lama Temple is told in this 1998 article by Robert L. Kaiser in the Chicago Tribune.